The front side of your ARTiPLAQ is sealed and the back side is not. It is best to keep your ARTiPLAQ in its wrapper and laying flat (or standing strait-not at a big angle), until you are ready to hang it. The slot, routed into the back of your plaq, is designed to accept ONE #8 Round-head screw. The screw(s) should be set into studs, or the appropriate wall anchor, to a depth that will result in a small amount of friction between the wall and the plaq: the underside of the screw head approximately 1/8th of an inch from the wall. Some trial and adjustment may be necessary. 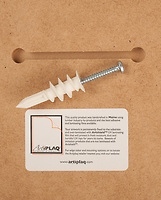 The screw should not be so loose that you can see behind the plaq-- it is meant to lay flat on the wall. And it should not bee too tight, it should be able to slide on the routed slot. That is why we say some trial and adjustment may be necessary. The reason why it should lay flat is because the front side is sealed and the back side is not. With your screw(s) properly anchored into the wall, rest the back of the plaq against the screw and slide the plaq up or down until you feel the screwhead engage into the slot. Keeping the screw head resting in the slot, slide the plaq left or right until you feel the screw drop into the hole at the end of the slot. Pressing the plaq against the wall, slide it to center of slot. If the plaq has two slots, (and before you drill the holes be sure the two spots are level) engage one screw into one slot, then slide the plaq back past the other screw to engage the other screw, then reverse the direction to center the plaq on the pair. Congratulations in advance for a job well done! 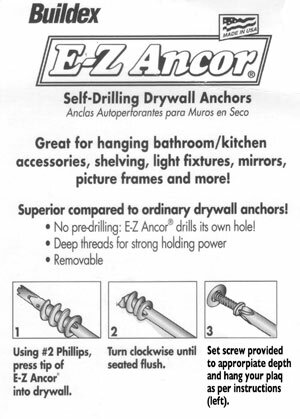 For setting your screw into drywall we recommend using a dry wall anchor (See diagram below). If the screw location is into a stud, no anchor is required. Other types of anchors are available for plaster, brick or cement walls. Ask your hardware store clerk. We do not recommend hanging ARTiPLAQ™ s by a wire because the backside is porous and absorbs moisture. Over time, hung by a wire, the plaque would bow. ARTiPLAQ™ s are meant to lay flat on the wall. 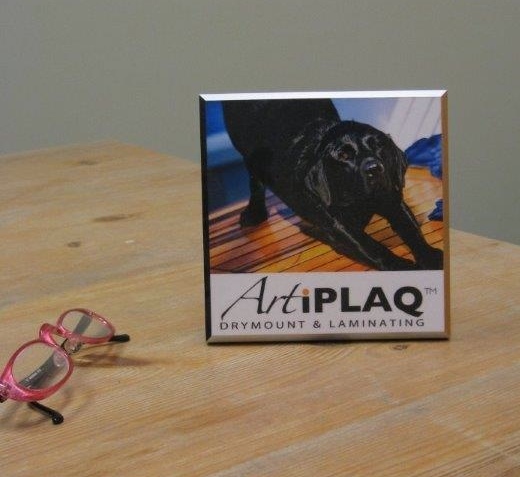 ARTiPLAQ™ s are intended for interior use only. The backside of the substrate is not sealed and is porous. Over time, water would seep in between the laminate and the edge color, ruin the paper print and destroy the wood substrate. Our wooden substrate, like any piece of furniture, absorbs moisture, so a consistent temperature is recommended. (The backside is porous and the front side is sealed.) That being said, generally speaking, ARTiPLAQ™ s work well in humid bathrooms and kitchens because even though the room gets humid, it consistently dries out, and is not facing long periods of extreme temperature fluctuations. Recommendation: When you close up your unheated summer cottage for winter, we recommend you remove your large nautical chart or ARTiPLAQ™ -mounted poster from the wall and lay it face down on a rug or smooth table. It will flatten out in the cold dry winter air and be ready for your return next summer. We typically include a hole and peg for a table top display, for free. 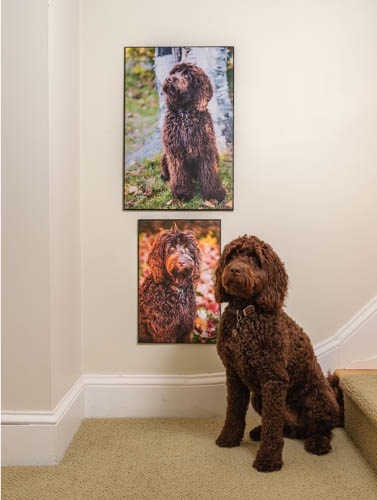 This easel-style works best with plaqs less than 8x10 inches. 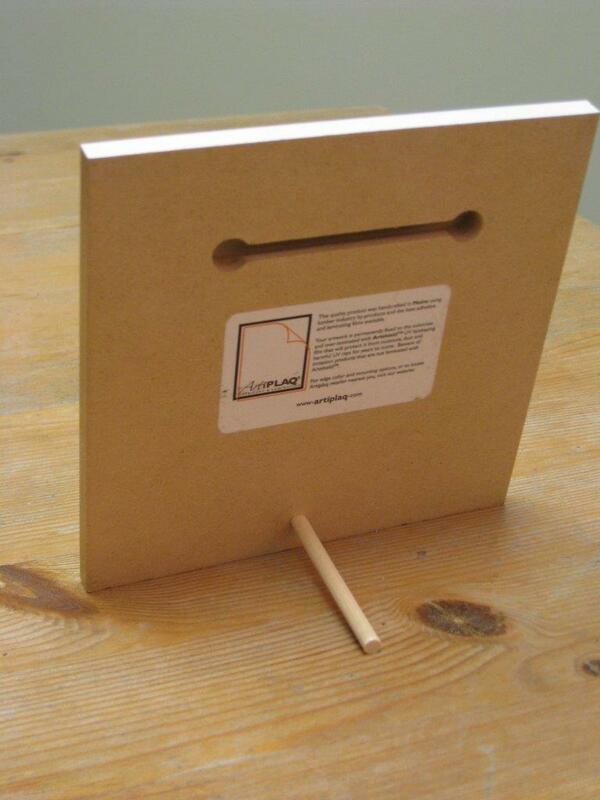 Remove the peg from the slot in the back and inset into the hole for a table top display. Small plaqs will hang on the wall on a small finishing nail. You may want to put a small amount of double stick tape on the back of one corner to keepthe plaque in place.